Happy first of June everybody! There are some brand new Daily Challenges to complete on Club Penguin Island and we, of course, have a tutorial on how to do so. However, I’d like to apologise for my bluelight filter being on…I forgot to turn it off! Hopefully it’s not a big deal! Firstly, head over to “My Style”/The Designer and create a new blueprint. Choose the pizza blueprint which is the first option on the second line. Design it and add whatever fabrics or decals you like, it doesn’t matter! Then buy it and wear it. Now go to a Party Supplies market and buy some pizza. Alternatively, ask someone to share a “Large Pizza” with you. Eat this pizza whilst dressed as a pizza and you will contribute to this community challenge! Note: It is not economically suggested you help complete this challenge if you already have mx Aunt Arctic’s XP. Head to Mt. Blizzard and go to the right of the area. Take the cannon up to where the Tube Racing tracks are and you will see the CPSN desk on the right. Have one penguin use the camera and two others waddle to the seats and tap the orange interactive button. 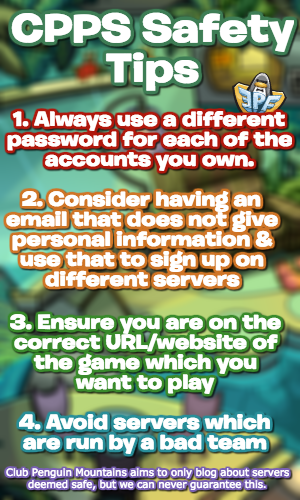 If you are one of these three players, you will be able to claim your reward! Go to Coconut Cove and go to the campfire there. Keep waddling up until you will reach the Shark’s Arch, which is basically a jawbone of teeth. It may take a few attempts but waddle up there to the top to claim your reward. If you keep falling off, maybe add the person who’s already up there as a friend and then friend jump to him. This is slightly more difficult to do, but still possible! Firstly, waddle over to Coconut Cove and choose a coconut tree. I find the easiest ones to be next to SS Convenience or the Sea Caves. Slowly jump your way up the bark of the tree until you get to the leaves. For the ones next to the Sea Caves entrance, use the rock to get up there. Once you’ve climbed three trees, hop back down and claim your reward! That’s all for the guide today – I apologise again about the bluelight filter issue. Thank you very much for reading, have a great day! Hi, remember when I told you I know a glitch in the cove? Here are the directions! I am sorry to say that this glitch can only be done by members, unless you know the Tube Glitch. You’ll need at least 4 penguins that are able to use a tube. You will need to go to the waterfall in the cove. Go to the edge of the SECOND rock. You will need to stack tubes on the second rock, kind of like the glitch in the boardwalk where you stack tubes to go over the rock wall. Try to stay still, for you all need to stack on top of each other. Tip: Hold your finger on the upper left hand corner of the bubble that lets you walk. This will help you stay in place and in the corner of the rock. If you are on top, you will be launched into the air(I couldn’t get a pic of me in the air, sorry). 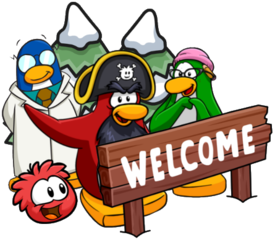 Guide your penguin forward a bit, because if you don’t, you will land behind the cove and automatically get transported back to land. You will then land in the grass on the other side of the cove out of the boundaries. Before you move at all, save your spot by going in and out of settings. Then carefully waddle out from under the grass. You will end up on the sand on the other side of the cove boundary. You can swim around a little bit, but don’t go too far, or you will be automatically transported back to where u were before. Hope you found these instructions helpful! The links are for pictures. OOPS! I’m so sorry, you sent these to me before and I completely forgot! Thank you for reminding me and sending them again, I’ll check it out today! Happy June years eve! And btw climbing up there (shark arch) is easy!